My initial experience with Perreaux was about six to seven years ago. Back then, I was still young and only getting started seriously into audio, I was on a look out for a decent used stereo pre amplifier. The owner was using a huge pair of Celestion bookshelf speakers and the power amplifier in use just happened to be from Perreaux. I was bowled over by the performance of the setup. The sound was open, lively and humongous in imaging size. Though long ago, the setup casted a strong impression in me in how an awesome pre-power setup could bring justice to injecting life to music. Even until today, from memories, the performance was still no slouch by my standard now. Sadly, I regretted for not digging deeper in knowing more about Perreaux then. Hence, I had no clue what model it was for the power amplifier. It was not until recently, when passed a Perreaux éloquence 250i integrated amplifier, that I recalled this past experience of mine. A little research on the web brought even deeper curiosity into the company's history as well as the product under review. I could not wait to discover how this little integrated amplifier could revive my past experience. The Perreaux éloquence 250i integrated amplifier, though smaller visually than my Bladelius Thor MKII integrated amplifier, was heavy and massive. It was taller, but not as deep and wide as the Bladelius Thor MKII integrated amplifier. Build quality was top notch and veering towards simplicity, equal attention was given to both form and function. A huge volume control knob flanked the middle, a round little push button on the left for on-off operation and five smaller buttons on the right performing different functions based on a menu driven interface shown by the blue LCD panel directly above the five buttons. The huge volume knob carried dual functions, by pushing in the knob it served as a select button for the menu driven interface, turning clockwise or counter clockwise would increase or decrease the volume respectively. Now, as I looked closer, the unit was built to the finest details with great care given to avoid any cut or slit during moving and positioning of the unit. 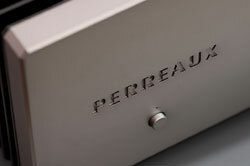 The Perreaux éloquence 250i integrated amplifier sported no sharp edges and corners. Even the heat sinks on both sides of the unit were so finely crafted that to get a cut from them is next to impossible. The Perreaux wording was engraved onto the 18mm thick front plate. 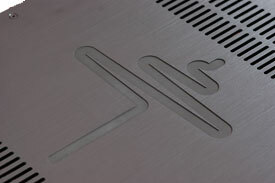 The most interesting feature was the huge pulse sign, which happened to be the company logo, engraved on the top plate. The unit exuded the finest quality in craftsmanship! And if those were not important, you would derive great joy in using and navigating through the menu driven interface. I was deeply impressed when I first switched on the integrated, after a relay mechanism click, a big “BOOTING…” word flashed on the blue LCD panel. That induced great excitement from an IT techie like me, and the unit sprang to live with huge numbered meter gradually increased to -40dB, the initial volume preset upon firing up. The éloquence 250i was equipped with a menu driven interface that was so versatile and intuitive. 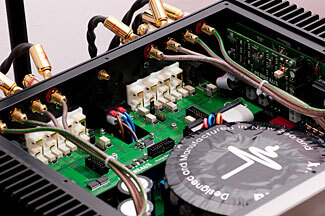 Many settings of the integrated amplifier were easily accessible and user customizable, the owner could easily name the inputs, enable only those frequently used inputs, match the volume levels between inputs, fix the initial volume level upon power up, as well as setting the maximum volume allowed. You could essentially customize the integrated amplifier to suit your usage pattern to a T. I seriously urge you to go through the manual describing in details the working and function of the menu system. I popped in the first CD and started playing. I was seriously impressed, I could not find fault with the unit! Everything was there, in fact, more! I played Safe Trip Home [ARISTA 88697307092], US pressing of Dido's latest album. The first three tracks were enough to convince me that there was something special about this Perreaux éloquence 250i integrated amplifier. I heard a huge increase in bandwidth and headroom from the delivery coming out of my ATC SCM20T floorstanders. I have never heard such low end extension from my floorstanders driven by my Bladelius Thor MKII integrated amplifier. The increased 100 watts from the Perreaux did bring so much more to the drivability and the sense of strong-footedness in rhythms. The added underlying foundation made listening to pop materials so much more enjoyable and foot tapping. As I listened longer into Dido, I found that with bigger power on tap, there was a lower mid presence from the Perreaux éloquence 250i integrated amplifier that lent the added body and richness to the musical instruments and vocalist. Imaging size emerged massive and dynamic, closely mimicking lifelike sizes, vividly reminding me of what I heard years ago from Perreaux's power amplifier. Indeed, Dido appeared full bodied, stably planted in the middle with perfect height and dimension. The imaging outline was accurately defined, yet did not sound like cardboard cutout that out casted Dido from the music. The imaging quality was very commendable with each musical instruments residing in their own space within the soundstage. I could only praise how accurately the Perreaux éloquence 250i integrated amplifier reproduced precise size and weight of the instruments in relative to each other. Without such fine act, there was no way I could perceive such seamless and cohesive musical reproduction. If there was one thing bugging me initially, it was the slight fine grain overcast in the vocal region. That disappeared as I pushed on listening to more than an hour from cold start. Throughout the residence of the integrated amplifier, I found that at least half an hour of playing at normal level is required to bring the best out of it. It could sound slightly hesitant if pushed hard. As I listened on, the unit gradually delivered in a more fluid manner. To get a better dynamic swing and leap out quality, spare at least an hour. I was relieved. I continued with another splendid CD recorded by Todd Garfinkle of M.A Recordings. All the songs were well known Mandarin pop classics covered by a veteran songstress. The recording took place in a school music hall measuring 25 feet by 30 feet, with the ceiling reaching 14 feet tall. The pieces were all rearranged in an unplugged manner with guitars, acoustic bass, percussion, bamboo and western flute. The musicians played live with the songstress singing at the same time, while Todd recorded using his pair of custom made B & K microphones. The recording sessions were carried out in two days, employing direct to 2-track DSD recorder, completely bypassing any mixing board. And with the ideal of matching what was recorded, Todd did almost no mastering at all. Some might find it a tad dry, but I like its raw and naked nature. If you are interested, the title is Deep… Blue… [Harmony Records HR0002-2] and the name of the songstress was "Skye". Since there was only a pair of mikes recording the songs, with big emotional swing that was required to carry those pieces, Skye had to sing with elevated strength. That had added so much passion and emotionto the performances. In track three, there were occasions where Skye was singing in such explosiveness that she was on the brink of bursting into tears. It was also during these occasions that the Perreaux éloquence 250i integrated amplifier demonstrated its splendid control and composure. This I have to elaborate more, in any live performance, the singers remained the compact and centralized source of energy. As the singer sings in sudden outburst, there is this swelling effect where you could feel the air surrounding the singer vibrates in an expanding manner. Yet, this swelling vibration should always remain tightly focused, held back and centralized around the singer, the source of energy. The Perreaux éloquence 250i integrated amplifier captured this essence with poise and realism, and as the singing frailed off, the Perreaux sealed it sweetly with delicate details of the hall reverberations. It seems apparent to me now that with added power and headroom, the Perreaux éloquence 250i integrated amplifier could push out more dramatic recreation of the sound-room interactions, conveying a better sense of dimensionality and space perceptions. The Perreaux could throw a huge and expansive soundstage with formidable layering and equal front to aft spread. Such fine integration and precise imaging quality could normally be found in laboriously crafted pre amplifier. To find such quality in an integrated amplifier did show how great attention had been given to the design of the line stage as well as the power supply section. Oooh, I almost forgot to mention a bold statement made by Perreaux, from the official website, the éloquence 250i was claimed as the world's most powerful integrated amplifier. With such brave declaration, what could I do but to try to put it to test? I tried pushing the Perreaux éloquence 250i hard and found something interesting about it. Instead of pouring all out showing its warts and all, éloquence 250i controlled itself with great self-assurance and self-possession, never faltering in its strongly footed imaging and expansive soundstage. It was performing so well within its capacity that it refused to throw itself out of place. This was indeed a great feat of hi-end. The Perreaux éloquence 250i might sound a tad dry, a tad stark and a tad less delicate towards the decaying end. However, it was due to the relative comparisons with the Bladelius Thor MKII integrated amplifier that created such impressions. The Bladelius Thor MKII integrated amplifier blended in much of the desired qualities of tube amplification, making it sound more delicate, sweeter and appeared more liquid in the vocal presentation. In fact, the Thor MKII happened to slightly sugar coat whatever going through it. And with lesser power, the Bladelius Thor MKII may sound livelier and younger due to its lighter presentation. While the Perreaux éloquence 205i integrated amplifier may sound rigid and arid at first, it never failed to convey music in its intended way. The Perreaux preserved faithfully the tones, textures and forms of instruments in a more lifelike manner. They were colorful and rich in tonal quality. With a meatier presentation, the Perreaux éloquence 250i sounded more seasoned and down to earth. I suspected that this might be due to the éloquence 250i's added brute and energy as everything appeared more effortless, bigger, bolder and better defined in body. I find such presentation came with lesser coloration. Indeed, the Perreaux éloquence 250i sounded less processed and raw, in the good way of course. As a final note, I do have to remind you to be realistic in expectations. Although the Perreaux éloquence 250i was quoted as having the same power delivery as some other dedicated power amplifiers, it would not challenge those in absolute driving power and control. But the éloquence 250i was more than capable within its own right and offered a glimpse of what a more powerful true separate could do. If you are looking for a no fuss workhorse with equal quality in form and function, the Perreaux éloquence 250i integrated amplifier deserves the highest recommendation. With no reservation. Telos pure copper platinum-plated RCA and XLR caps.